Nathan Punh, left, talks with UCCE farm advisor Margaret Lloyd, who works with about 60 Mien farms in the Sacramento area. Slugs, snails, ants, aphids, spider mites and inclement weather conspire against strawberry growers harvesting perfect red berries to sell. 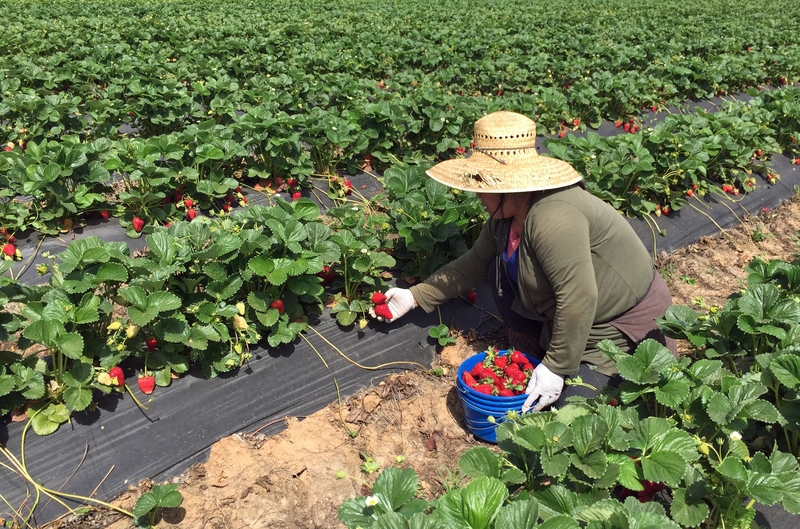 “Farming is hard work,” said Fam Lee, as she pulled a weed from a row of strawberry plants. 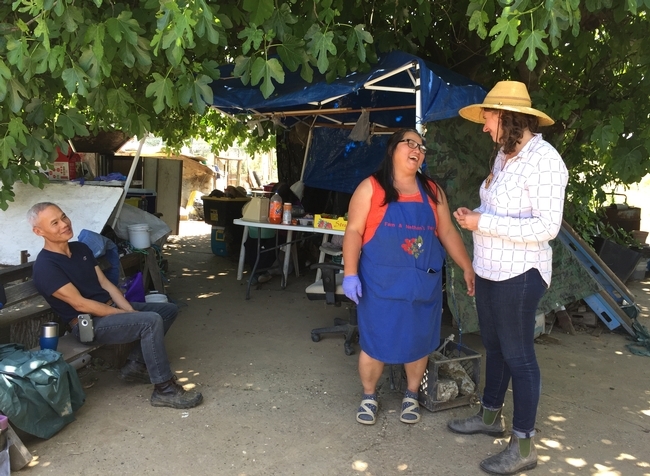 Lee and her husband Nathan Punh are among about 60 Mien farmers in the Sacramento area who call on Margaret Lloyd, a UC Cooperative Extension advisor, for farming advice. Fam Lee examines a strawberry for insect and slug damage. “Although we are not organic farmers, we always want to go with organic,” she said. In the Sacramento area, many of the Mien-owned farms are husband and wife teams. The typical couple farms an acre or two themselves, picking berries to sell the same day at a roadside stand, which provides the family's primary source of income. Some Mien growers had never seen a strawberry before arriving in California, but chose the high-value crop to maximize returns on their small plots of land. 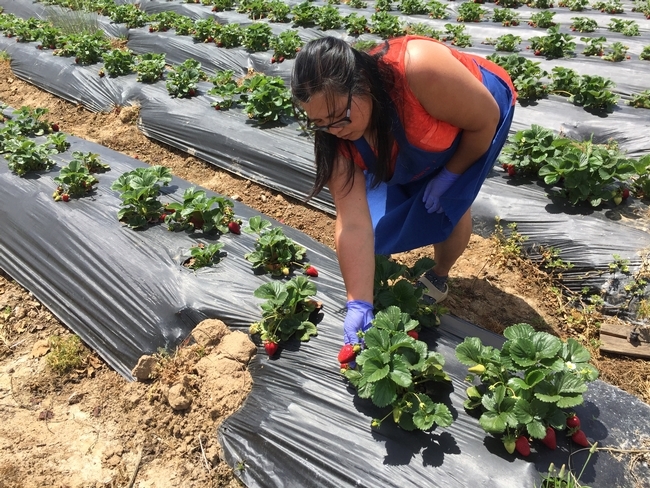 To help Mien growers develop successful strawberry farms, Lloyd updates them on regulations and shares growing tips at an annual extension meeting, visits them at their farms, and records videos demonstrating how to do things such as using compost to fertilize the crop. Visiting Mien farms makes it easier for Lloyd, right, to demonstrate practices for farmers who aren't fluent in English. “Because of language barriers, coming out to the farm regularly is a big part of the job,” said Lloyd, who partners with staff from the National Center for Appropriate Technology (NCAT) to assist Mien farmers. 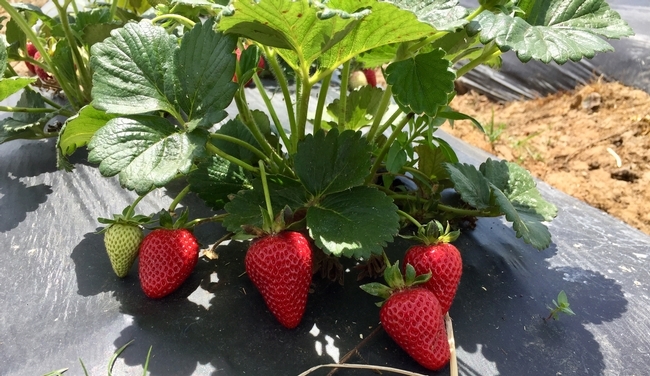 The UC-patented strawberry cultivar Albion produces large, sweet berries. 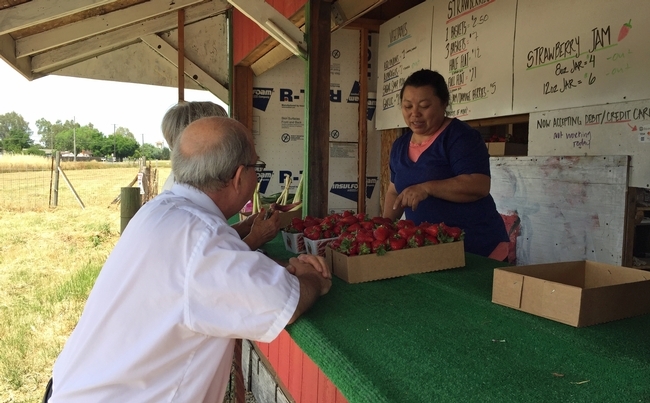 For the past five years, Lee and Punh have been growing and selling strawberries at a farm stand on Bond Road, between Bader and Bradshaw, in Sacramento. They grow Albion, Chandler, Santa Rosa and Seascape – sweet, delicate varieties, some of which aren't found in supermarkets because the berries don't store and ship as well. They typically begin harvesting berries at the end of March and pick through July or August, depending on the weather. This year, the first berries were ruined by spring rain and frost. 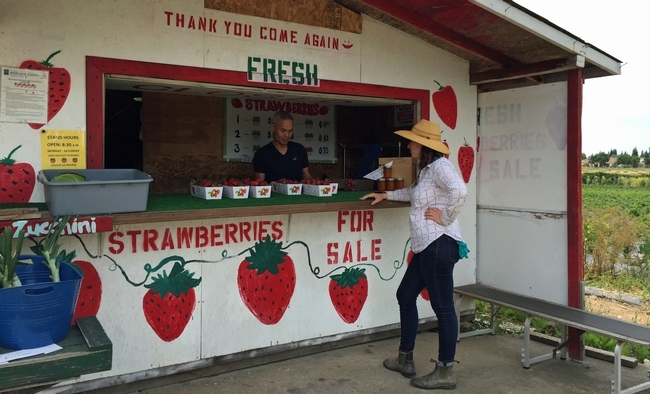 Established farm stands, like this one on Florin Road at South Watt Avenue, develop a loyal following of customers who eagerly await their opening to buy strawberries. Because berries sold at the roadside stands are picked fresh daily, the farmers wait until berries are perfectly ripe before picking them. Monday through Saturday, Lee begins harvesting her strawberries by hand at the break of dawn. Lee's parents often drive up from Alameda to help pick berries. 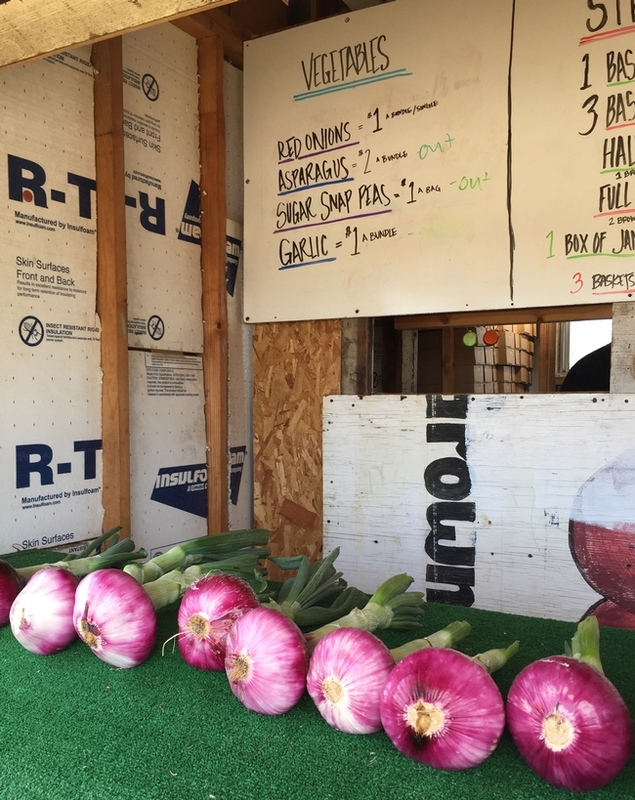 Some farm stands offer vegetables, like these red onions, to complement the strawberries. To extend the farm stand season, some Mien farmers supplement the strawberries with other berries, strawberry jam and vegetables. They grow blueberries and blackberries, tomatoes, peppers and green beans and sometimes specialty vegetables such as bittermelon. “Growing strawberries isn't easy, but it's enjoyable work,” Lee said. Lloyd has updated a map showing locations of about 60 strawberry stands in the Sacramento area at http://bit.ly/strawberrystands. 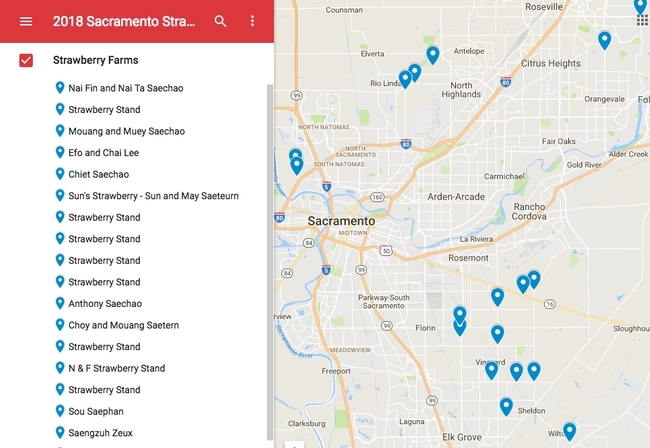 To help consumers find the Mien farm stands, UC Cooperative Extension has created a map showing locations in the Sacramento area at http://bit.ly/strawberrystands.